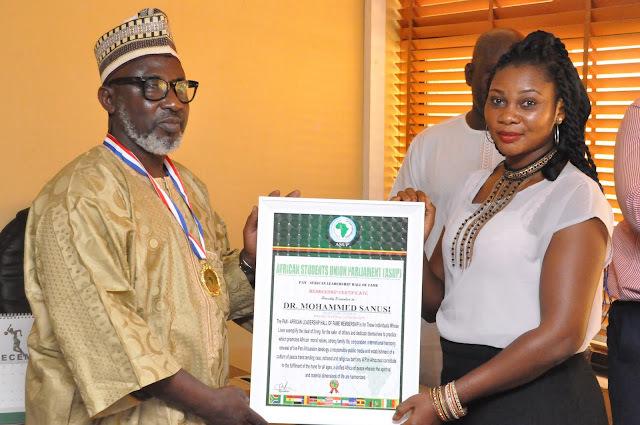 NFF GS, Dr. Sanusi receiving his certificate as Africa’s Patriotic Personality of the Year from Comrade Francine Etongo. The body of the African Students Union Parliament on Monday conferred on the General Secretary of the Nigeria Football Federation, Dr. Mohammed Sanusi, the honour of ‘Africa’s Patriotic Personality of the Year,’ while also inducting him into the Pan-African Leadership Hall of Fame. At a simple ceremony inside the NFF Secretariat in Abuja, representatives of the body led by the Speaker of Parliament, Rt. Hon. Kewul Abel described Sanusi as a selfless leader, prudent administrator, positive force in the promotion of peace and development of Nigerian Football and a man concerned with community and human capital development. A plaque and a certificate were presented to Dr. Sanusi, with other representatives Francine Etongo, Henry Nwankwo, Zainab Sule, Epah Bublo and James Uneze watching. NFF Executive Committee members, Alhaji Ibahim Musa Gusau (who represented the NFF President) and Alhaji Mohammed Alkali, Mr. Ayobola Oyeyode (Director of Competitions), Mr. Ademola Olajire (Director of Communications), Mr. Abdulrafiu Yusuf (Assistant Director, Technical) and Ms Ruth David (Head of Women Football) were also in attendance. Extolling Dr. Sanusi as “a remarkable, reliable and indefatigable sports administrator of international repute, whose life is contributing more than a building block towards the advancement of the noble course of Pan-Africanism through effective and selfless leadership skills,” Abel charged Sanusi not to restrict his intellectual abilities to promoting the round leather game in Nigeria alone, but to extend same to other African countries through exchange programs, peer review mechanism and regional football conferences. Acknowledging Sanusi’s outstanding understanding of effective service delivery and youth empowerment, the ASUP, which is the umbrella body for all students within the 54 AU –recognized African countries, noted that the dream of building a better society is sacrosanct and tedious, and can only be achieved through collective and collaborative efforts of well-meaning individuals like the NFF General Secretary. Responding, Sanusi thanked ASUP for the special recognition and commended their campaign against the abuse of drugs and other related substances. He lauded the body for its vision and industry. In his short remark, Alh. Ibrahim Musa Gusau, who stood in for the NFF President, hailed the students for their astuteness in recognizing the qualities in Dr. Sanusi, whom he described as an energetic, industrious and shrewd administrator par excellence.